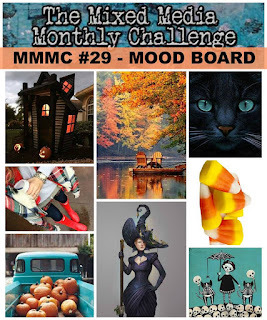 Creative Juice: Mixed Media Monthly October Mood Board Challenge! Mixed Media Monthly October Mood Board Challenge! Welcome to October everyone. It's time for everything pumpkin spice and the new challenge over at the Mixed Media Monthly blog! This month our fabulous sponsor is Stampotique Originals and they are giving a $30 gift certificate to our random winner. You can’t miss out on this challenge; their stamps are so wonderful! This was easy to put together (the hardest part is fussy cutting the stamped images.) I used the Flower Pocket die to cut the container out of Sizzix matboard (it takes ink and media so well!) 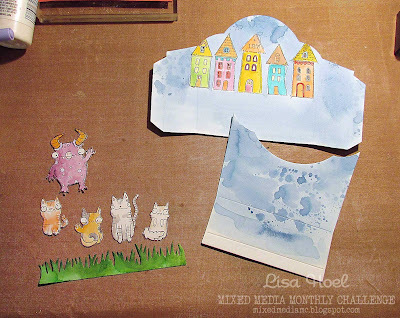 I stamped the kitties and the monster with black archival ink and then used Distress Markers, Ink and water brushes to color them. The houses I stamped directly onto the matboard with the archival ink and colored them as well with Distress. After fussy cutting the figures, I attached them to the assembled container and popped the kitties and grass out with foam tape to give them dimension. 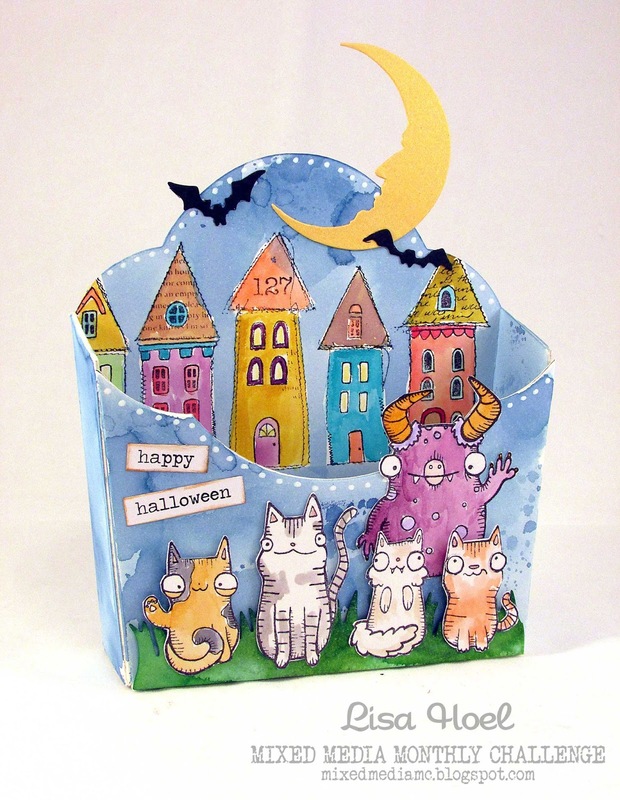 A diecut moon and few bats finished off my Halloween scene! Be sure to head on over to the MMM blog to see all the inspiration by the design team and our guest designer, Julie Steed. Join in our challenge and you will have a chance to win a $30 gift certificate to Stampotique! Wow! Love your project! So fun and usefull. Adorable! Your houses and creatures are so fun!! I love this fun project. My grandchildren would love getting something like this full of treats. 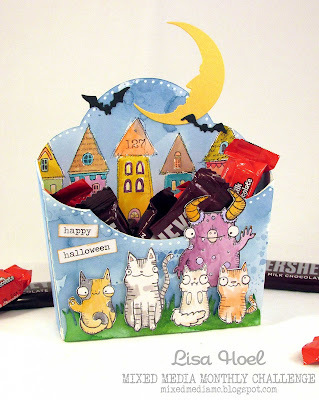 This "fry box" for treats based on the Mixed Media MC moodboard is fabulous, thanks for inspiring! 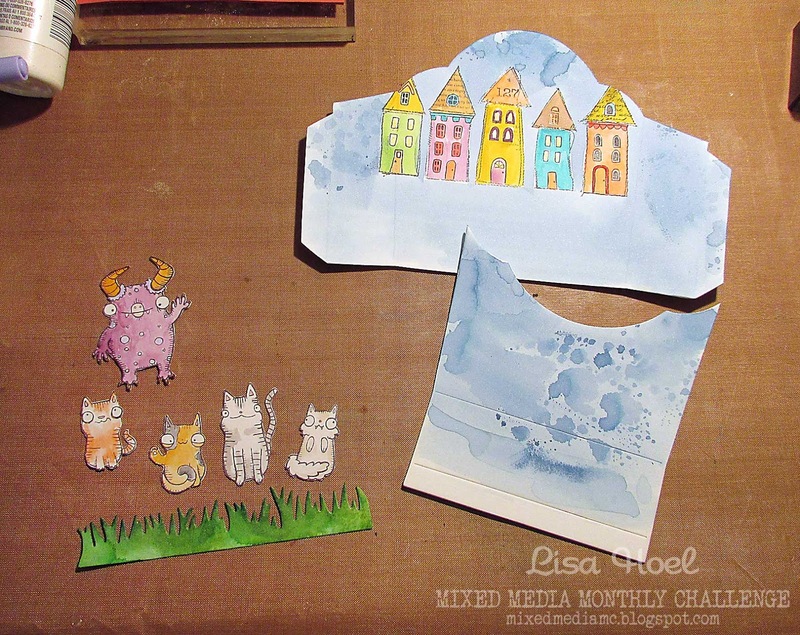 Mixed Media Monthly is a new discovery for me. I'm so excited to see all the creative work being done. What a great treat holder. So fun! I really like the design of your blog too! This is just precious! Who wouldn't love to receive this sweet envelope full of treats! ?